The Retina display, which pioneered on the third generation iPad, is of course onboard, offering four times the resolution of the iPad 2 and iPad mini at the awesome 2048 x 1536 pixels. The pixel density is far from the iPhone's 330ppi, but it's still only beaten by the Nexus 10 and its 300 ppi screen in the tablet realm. The Retina display offers a lot sharper images, the pixels are barely visible even really up close and the tiniest text is perfectly readable. Note that some iPads come with warmer (yellowish) color scheme and some with colder (bluish). 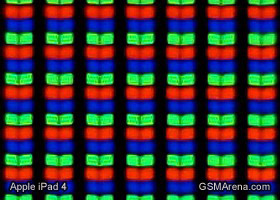 This is an issue on all iGadgets - depending on the screen manufacturer, each iPhone/iPad has a warm or cold color scheme. Vibrant colors and the great viewing angles are among the display's key assets but outdoor performance could've been quite a bit better. And here is a snapshot of the display's matrix. Remember the iPad 3 getting uncomfortably hot under heavy usage? We certainly do and, considering the new architecture of the iPad 4, we were curious to test it and see if it has a similar problem. 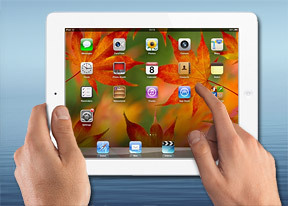 The iPad 4 was tested alongside the iPad 3, iPad 2 and the iPad mini. We started on the Epic Citadel demo - a non-Retina app, and the four devices were freshly woken up from hibernation. Epic Citadel ran for about half an hour on all four slates, after which the two Retina tablets switched to Infinity Blade II and its Retina graphics. We run the game for half an hour but took temperature measurements both halfway through the test and at the end of it. So here is the temp graph. As it turned out, the new iPad 4 is a tad cooler than the iPad 3 regardless of whether you are using a heavy graphics app. In most cases the difference is between 1°C and 3°C, which is something you can actually feel. Yes, the iPad 4 can get slightly hot, especially in the bottom left corner, where the chipset is but it sure isn't intolerable, and compared to the iPad 3 it's far less prominent. If you opt for an iPad, and it's your first time, you'll need some time to get used to it. We mean the full-size version of course, not the mini. Having used the iPad mini for a while, the big iPad 4 felt a bit awkward at first. However, the effort was more than worth it considering we were going back to a Retina display. The split keyboard is quite helpful (it's pointless on the mini), and given that for most of you having the iPad in your lap or using the case as a stand is the usual scenario anyway, there's little to worry about. This one is not going to become your best travel buddy as it feels more in place on your couch, but that's the case with all large tablets these days. With an aluminum unibody, the iPad has probably the best build quality among tablets, and in terms of styling it falls just short of the iPad mini.